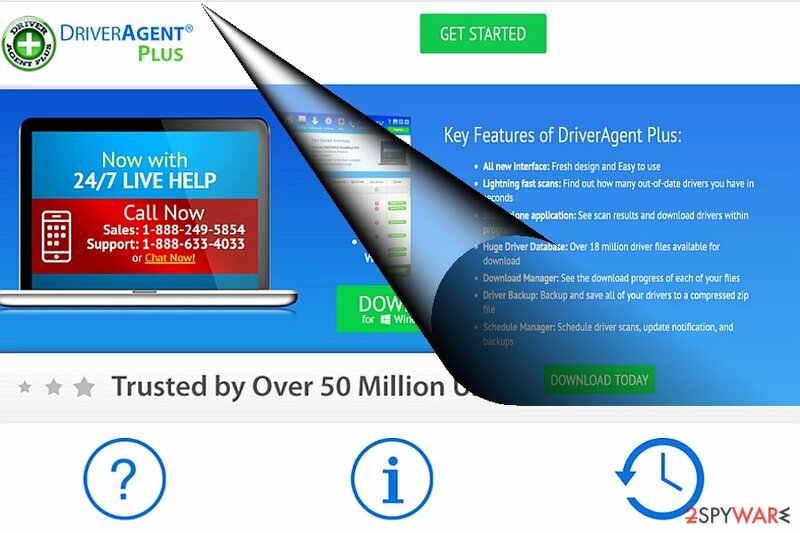 DriverAgent Plus is the PUP that uses misleading techniques to prevent removal. Use Reimage to locate malicious components and get rid of them faster than with uninstall instructions. A full system scan blocks virus reappearance and prevents traffic to malicious domains. 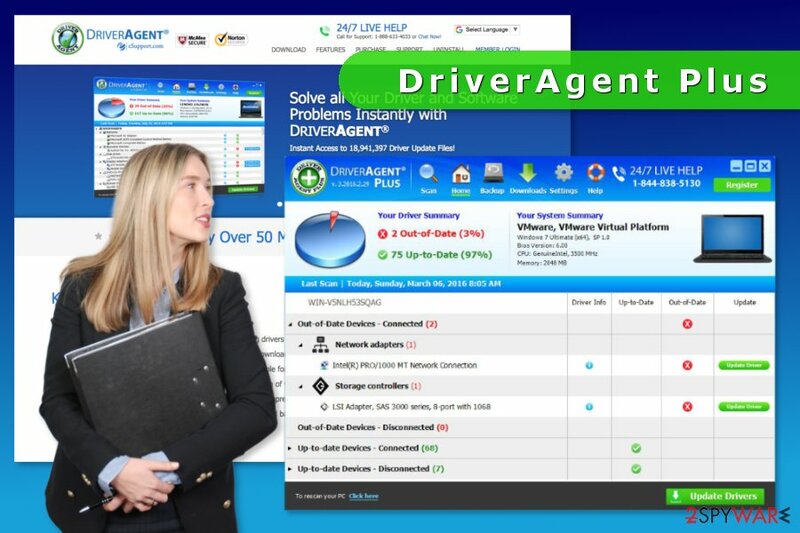 DriverAgent Plus is a legitimate computer optimization program created by eSupport.com, Inc. The software is designed to check computer’s system and detect missing or outdated drivers. The program is compatible with Windows OS starting from XP and finishing with Windows 10 version. You can download this program from its official website. However, previously you may have also noticed it while installing other software. Therefore, users who do not install new programs correctly might overlook an offer to install this PC optimization software and think that it infiltrated their PC system. For this reason, they often refer to it as potentially unwanted program. The main thing we want to stress out here is that DriverAgent Plus is NOT a computer virus. This program is not malicious and cannot infiltrate the system without user’s permission. The only problem here is that users do not install applications correctly and give such permissions without even realizing it. If you do not want to install various programs (including potentially unwanted applications), you have to always use “Advanced” or “Custom” installation settings to see additional downloads and reject their installation. Computer users also report that installation of DriverAgent Plus lead to increased amount of online ads, redirects to questionable websites and other computer-related problems. However, the main problem here is that users may have downloaded it from third-party download sources instead of the official website. Unofficial download sites often include adware, browser hijackers or potentially unwanted programs (PUPs) that might be responsible for bringing unwanted ads on your computer that have nothing in common with Driver Agent. However, if you have downloaded this PC optimization program intentionally and now you think that you want to uninstall it, you can do that just like with any other application. If you have installed a software package, it’s possible that there was a PUP in it as well that is now causing computer-related problems on your computer. DriverAgent Plus has nothing to do with these issues. DriverAgent Plus is a computer optimisation program that fixes corrupted, outdated or missing drivers. The DriverAgent Plus program has an official website and is available to download on various third-party sites. Therefore, users, who are looking for a tool to fix drivers on Windows computer, can download it directly. Additionally, the program may be promoted in various software installers. It’s a legit software marketing technique that might be tricky for those users who do not pay attention to software installation. When you download and install particular program from the Internet, you are offered to choose between Advanced/Custom and Quick/Recommended installation mode. If you opt for the latter method, you give indirect permission to install a whole package. In this way, DriverAgent Plus may enter your device as well. To avoid installation of unwanted applications, you should always rely on Advanced/Custom installation and read each of the steps attentively. If you see pre-selected statements agreeing to install third-party apps, you should always unmark those ticks. Thus, these additional programs won’t get the permission to be installed on your PC. Therefore, you should understand that DriverAgent Plus CANNOT enter the system without your permission. You should be more careful with installation next time. 3. Choose DriverAgent Plus and select the Uninstall/Change option. 4. Click Yes and OK to save the changes. If you have installed this program unintentionally during freeware or shareware installation, you should use the same steps. ^ What is a driver?. Microsoft Docs. Technical documentation, API, and code examples. ^ Potentially Unwanted Programs: How to avoid installing PUPs. The Windows Club. The blog about Windows 10/8/7 tips, tricks, help, support, tutorials, news, freeware downloads, features and more. ^ Vangie Beal. Computer virus (virus). Webopedia. Online tech dictionary. ^ Joel Lee. The 7 Worst Places for Downloading Windows Software. MakeUseOf. Guide in modern tech. This entry was posted on 2017-11-02 at 09:09 and is filed under System tools, Viruses. You can quickly scan the QR code with your mobile device and have DriverAgent Plus manual removal instructions right in your pocket. How did you remove DriverAgent Plus?